In 1983, The Spindrift, a commercial spaceship on a flight from New York City to London, became lost when it passed through a strange cloud in the ship's orbit around Earth. It landed on an alternate Earth-type planet, where the inhabitants were roughly twelve times the size of the Spindrift's passengers. So was the basic premise of this classic televions series from the late 60's. 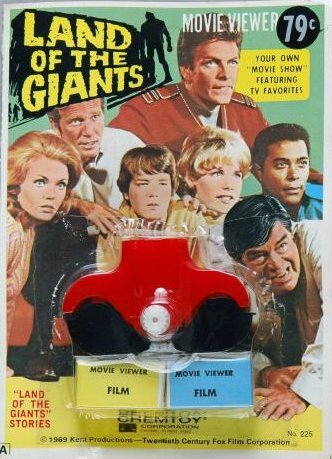 Made by the fine folks at Chemtoy comes this Land of the Giants Movie Viewer. The photo front features an image of the entire cast of the classic television series. The package contains "Movie viewer and episodes of this exciting subject". It proclaims "Your own �movie show' featuring tv favorites". Back features logo of the series along with instructions on how to use the viewer. Measuring approximately 5.25x7.25", the blister card is in nice shape. Warping on the bottom and right from age, but the image is clean and bright. There is a 79 cent price stamp on it that is not s sticker. Back of card slightly dirty, but still a solid piece. Old store stock. This is an unpunched card, and nearly impossible to find!